This pretty pendant from Evoke is crafted from sleek sterling silver plated with classic 9ct rose gold for a luxurious finish. 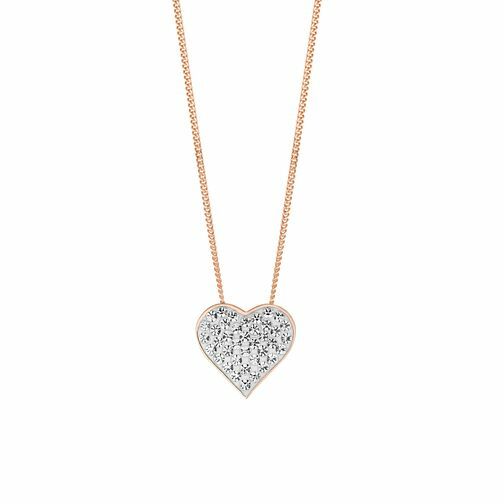 With a classic heart shaped design, this elegant pendant is set with shimmering Swarovski crystal elements for a splash of sparkle. Evoke Silver & 9ct Rose Gold Plated Swarovski Pendant is rated 5.0 out of 5 by 1. Rated 5 out of 5 by Anonymous from Really pretty necklace I bought this necklace for my sister’s 50th Birthday. I liked it so much I popped it on my Christmas list. It’s very delicate, and the crystals really do sparkle, so it can dress up any outfit.